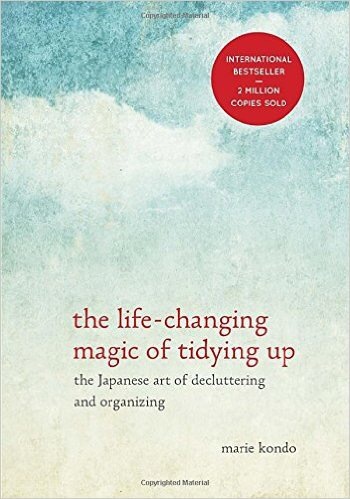 On a recent flight during the holidays, a woman seated next to me was reading, The Life-Changing Magic of Tidying Up: The Japanese Art of Decluttering and Organizing by Marie Kondo. When she turned and asked me if I had read this book, I told her I was familiar with the concept through snippets I gleaned from TV and social media: get rid of those things that do not spark joy, handle your clothing respectfully, and when in doubt, throw it out. After a brief exchange of ideas, I reflected that although unfamiliar with Marie Kondo’s Zen-like relationship with possessions and strict rules for decluttering, I actually developed a propensity for organization from my mother whose practical wisdom motivated me to keep things tidy and orderly. My mother’s mantras still ring in my ears, “Why handle something twice? Put things where they belong the first time (especially keys). Consider the next person who might also need to use it. Keep like things together.” I believe my mother and Marie Kondo would have found common ground. As a primary teacher for many years, I strove to keep materials and supplies for teaching and learning readily available in a safe environment. Fortunately with today’s digital landscape, we don’t need to keep files of lesson plans and piles of worksheets, but we still have to manage how our essential physical or digital materials are handled, and how time and space are best used for instruction. Most teachers spend significant time designing their classroom space for an optimal learning environment with special attention to various groupings for student learning activities. Here are some interesting resources to help us think along these lines of organization and decluttering for better living and learning. Today technology plays a huge role in our personal and professional lives. Certainly, there are many apps and tools for organizing tasks, backing up data, and enhancing the teaching and learning process. One of the handiest ways to lessen paper pileups and document student learning is the camera roll on our digital devices. Take photos of work in progress, writing samples, brainstorm sessions, report-out charts, etc. In classrooms where students have access to consistent and reliable use of technology, they can document steps in their learning process or procedural tasks. Teachers can take photos of work for referencing during conferences. Photos and videos in the camera roll are then available for incorporation in other content creation and curation. While focusing our attention on tidying up for efficiency and productivity, this might be a good time to question ourselves about classroom lessons. Are there any instructional practices that could use a “spark of joy?” Can we find ways to declutter the curriculum, guide deeper learning experiences and/or empower students to take more ownership in demonstrating their learning? Matt Miller (@jmattmiller) offers some new, creative ways to use technology in keeping students engaged. In one of his blog posts from Ditch That Textbook, he suggests twenty engaging activities that don’t add extra time and don’t take much extra effort. One that I found enticing was creating an ebook using Google Slides. Change dimensions to 8.5 by 11, design and create each page, download as a pdf file and it is ready for digital sharing. Has this New Year motivated you to find opportunities for reorganization in your personal and professional lives? Where can you inject a spark of joy into an established routine? What practices do you find life-changing? Please share in the comments below. Rita, your stories about your mother involving decluttering resonated with me and reminded me of my own mother. I constantly go through my closet and room finding things I don’t wear anymore or have use for. It is one of my favorite things to do! As a future educator this is such a great reminder to keep the classroom organized and have information/resources readily available. Thank you so much for the inspiration and encouragement! Rita, Such perfect timing – as so many of us create and refine syllabi for the upcoming spring semester — your post reminds us to declutter our syllabi. I am also inspired by your post to invite my students to share how they create, maintain, and revise spaces for writing, reading, making, thinking . . . Love the connection to your mother’s words/mantras – a fabulous post on so many levels. Thank you! Thanks, Mary. Your students have a lot to manage with time and spaces for learning. I look forward to some of their ideas. Rita, I love the way you connected the ideas of physical environment, instructional practices, and digital space. This post really resonated with me, and I’m going to share it with my students. Thanks! Thanks, Jancie. There are so many layers of management for teachers. The New Year is a good time to take some inventory. Thanks, Fran. Here is the link if anyone is interested. Thanks for adding the link, Rita. This is a great concept, tidying up that is! For those interested, Evernote is offering a free audible.com audio book of this title.thegood part is that you don’t have to be an Evernote subscriber. The offer is good until January 17. BTW Evernote is a great digital way to declutter.